When Diwali/Deepavali holiday in telangana/ andhra pradesh? TS GO. 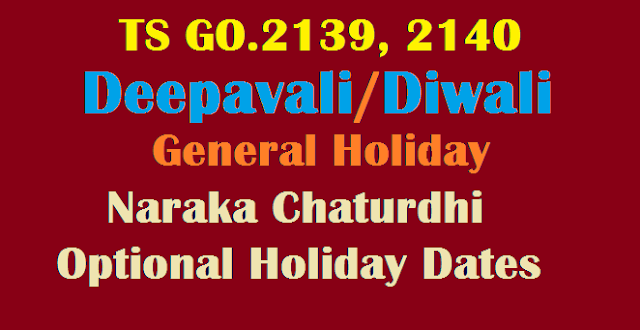 2139 Deepavali/Diwali General Holiday on 19-10-2017 instead of 18-10-2017 and Naraka Chaturdhi Optional Holiday on 18-10-2017 instead of 17-10-2017 wide G.O.Rt.No. 2139 Dated: 16-10-2017. Declaration of Optional Holiday on 18.10.2017 (Wednesday) on occasion of ‘Naraka Chaturdhi’ instead of 17.10.2017 (Tuesday) and General Holiday on 19.10.2017 (Thursday) on account of ‘Deepavali’ instead of 18.10.2017 (Wednesday) –Amendment – Orders – Issued. Read the following:- 1. G.O.Rt.No.2529, Genl. Admn. (Spl.E) Dept., dt.22.11.2016. 1. In the G.O. 1st read above, Government have issued orders declaring 17.10.2017 as Optional Holiday on the occasion of “Naraka Chaturthi” and 18.10.2017 (Wednesday) as General Holiday on account of ‘DEEPAVLI’. 2) In the reference 2nd cited, the Commissioner of Endowments, Telangana, Hyderabad has informed that ‘DEEPAVALI’ will be celebrated on 19.10.2017 (Thursday) instead of 18.10.2017 (Wednesday). In partial modification of the orders issued, notifying the General Holidays and Optional Holidays in G.O.Rt.No.2529, General Administration (SPL.E) Department, dated 22.11.2016, Government hereby declare the Optional Holiday on 18.10.2017 (Wednesday) on occasion of ‘Naraka Chaturdhi’ instead of 17.10.2017 (Tuesday) and General Holiday on 19.10.2017 (Thursday) on account of ‘Deepavali’ instead of 18.10.2017 (Wednesday). HOLIDAYS – Declaration of Holiday on 19.10.2017 (Thursday) on account of ‘Deepavali’ instead of 18.10.2017 (Wednesday) under Negotiable Instruments Act, 1881 – Amendment – Orders – Issued. In the G.O. 1st read above, Government have issued orders declaring 18.10.2017 (Wednesday) as Holiday under N.I.Act, 1881, on the occasion of ‘Deepavali’. In partial modification of the orders issued, notifying the Holidays under Negotiable Instruments Act, 1881, in G.O.Rt.No.2530, Genl. Admn. (Spl.E) Dept., dt.22.11.2016, Government hereby declare Holiday on 19.10.2017 (Thursday) instead of 18.10.2017 (Wednesday) on account of ‘Deepavali’, under Negotiable Instruments Act, 1881.